favorite snacks. It helps remind you when you're all done! I received the Yum-Yum 9 Inch Dinner Plate in Cherry Red from Yum-Yum Dishes. 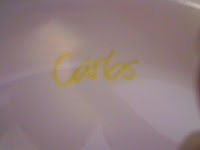 The first Review I did for them was the Yum Yum Snack bowl in Sunshine Yellow. I am head over in heels with the Yum Yum product's! Being constantly on a diet, having to watch what I eat, and my serving portions was always a hassle with regular bowls and plates. When you are hungry and having to eyeball your food such as..Meats are the size of a deck of cards. it's a pain trying to not over eat at home and even worse at yummy restaurants. I'm a big snacker. Potato chips are my weakness. So when I got my Yum Yum bowl it was such a life saver! It helped me portion my snacking down by 90% I eventually learned how to curb my snacking and meals down by just the bowl alone! And so when Hanna E-mailed me about their new Yum-Yum dishes plate review I couldn't say no! I just started the frozen meal dinners that you can buy at walmart such as weight Watchers, Healthy Choice, Ect. Some of the portions can be crazy and eyeballing it isn't always enough. I love to cook for my husband, and My husband loves my cooking, he works 10 hours and some times longer so when I cook I like to make a little extra because I never know how hungry he will be that night.. I don't eat untill he is able to sit down and eat with me and that sometimes leaves me extra hungry and that is a bad combination when you have to eyeball your food on regular plates. That's when my amazing Yum-Yum plate swoops in and saves my diet! 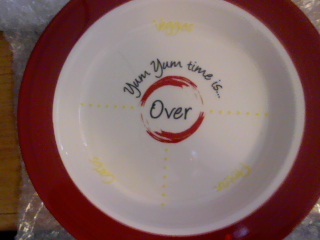 I am able to portion control my meals down with the divided Yum-Yum plate Every dieter needs. The Yum-Yum plate comes with 3 divided sections. 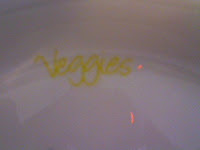 Veggies - Every dieter needs greens in their diet meal. Even if you are not on a diet but need to plan out better portions of salad, green beans, pea's, or even mustard greens. The 9 Inch Dinner Plate is perfect for grown ups or even kids! Have children that don't eat their veggies every meal? this is a perfect way to keep track of how much they eat every dinner meal. Carbs - Carbs are my weakness. I love potato's! Mashed, fried, baked, cheesy, my most favorites are the french fries and potato chips. They are my weakness I try my hardest not to eat carb's of any kind but I always end up with my hand in the potato chip bag every time. There are ton's of carbs to get yourself into trouble with. But with the Carb's divider I can still have my carbs without over doing myself. What carb is your weakness? Protein - Protein is another little trouble maker of mine. 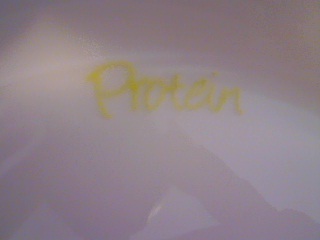 Yes Protein is good for you, of course. But I'm a serious meat eater. I can eat meat anyway you serve it as long as it taste good. I tend to over do my meats when I'm doing a diet. This leads back to my previous statement above. You are only supposed to eat a deck of card worth of Meats (Protein) or you can subsitue a little more meat if you subtract carbs and replace it with more green veggies. The whole diet thing can seriously strain your brain if you are not careful. That's why I still love my 9 Inch Dinner Plate I can eat what I want at the portions that I need. I'm not really sure how I ever lived without Yum-Yum dishes in my life for all this time. I know I will never go without it again that I know of! Yum-Yum comes in the colors of.. If you are a family going on a diet or you want your family to eat better what way then the Yum-Yum way! Trust me, You won't be disapointed! The Yum-Yum crew should start selling Yum-Yum drinking glasses next. What a better way then to start having better portions of milk, coffee, and another weakness of mine..Soda! Thank You, Hannah! ♥ I received no monetary compensation for this review. I was provided a Yum-Yum Plate to try and give my honest opinion(s).